It was very appropriate that Thursday night's episode of "Parks and Recreation" ended a near-flawless season with one of the funniest half-hours of any show this season, period. Before I get to that, though, there was another episode preceding the finale, involving Leslie and Ben's burgeoning relationship, one of the bigger story arcs of the past few weeks. Their attempts to hide the relationship from Chris Traeger and the rest of the office blew up in their faces when Leslie's mom made a pass at Ben. This also led to the couple's first fight: As Ben described it, "Should we talk about how you claimed your mom was a Filipino woman you've never met?" At the same time, Chris' office changes also blew up in his face, especially the "swivel!" chair for Ron Swanson, who likes his office "and its many walls." The scene where a Pawneeite comes to speak to Ron, who keeps swiveling out of her view, was masterfully executed. Then we have Tom Haverford, who was forced to move up to the dreaded fourth floor: "There's a whole room on the fourth floor where they store the knives they've confiscated from people who went to the fourth floor to stab someone." Try as he might, even turning on the "charm ray," Tom's move was part of a failed experiment, and of course, it took a talk from Ron to bring things back to normal. As funny as that episode was, it paled next to the finale, which began with Leslie reminding everyone of the town's favorite citizen, Li'l Sebastian the tiny horse, before breaking the news that he died. Everyone was devastated, even Ron who said, "Half mast is too high. Show some damn respect." Doing a funny funeral episode is dangerous territory after the "Mary Tyler Moore" show's iconic "Chuckles Bites the Dust," but I would definitely put this in the same category. The memorial service alone was fantastic. Put on by Tom and Jean-Ralphio's Entertainment 720, the service remembered Li'l Sebastian with a tribute video, Andy debuted his song "5000 Candles in the Wind," and Ron - who much prefers laying wreaths to lighting torches - had his eyebrows and part of his mustache burned off. 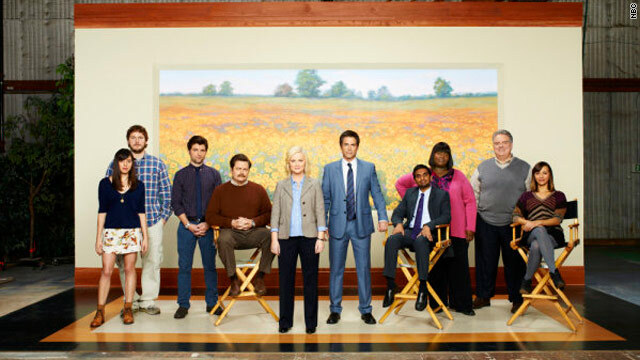 The last few minutes showed a lot of upcoming changes for Pawnee's Parks and Rec department, including Tom's resignation, Andy's invitation to April to be his manager, Leslie getting a chance to run for office (and lying about Ben), and best of all, the return of Megan Mullally as Ron's ex Tammy. Then the unseen "Tammy One" showed up in Ron's office, scaring off the other Tammy. All in all, I'm very happy to know that this show will be back in the fall, and we won't have to wait as long for new episodes as last time. Did you enjoy this episode as much as I did? Who has been your favorite character this season, and who should play "Tammy One" next season? Share your view below, or on iReport. Next entry »'The Office' interviews: How did the applicants do? My daughter just turned me on to this series. It is HILARIOUS. It's the funniest show on the air these days. @Donald – and I suppose "16 & Pregnant" and "Jersey Shore" are aimed at people like Bill Gates? If you think network television is beneath you, why did you bother to watch it? Are you incapable of not clicking on an article regarding a show you don't even like? Doesn't say much for your own intelligence. I'd much rather watch a show that time and effort was actually put in to create a story line than any of the "reality" shows where they take the real trash and display them for everyone's enjoyment. Favorite character is April but not for these last 2 episodes. For the bar and the wedding episodes. Classic! I gots to get me some of that black gurl lovin this weekend. Downtown Chicago im on my way ! I gots me some chewin tobacco plus my grandma is lookin for some lovin ! Plus with the rapture coming up and all, tonight I am going trolling in our trailer park for some recreation. I already have my natural male enhancements ready = GROUPON has them at half price ! Here chicky baby. . . . here chicky baby. . . . I live in a nice doublewide trailer. What is wrong with that ? Yes i am between jobs right now but everyone else is too. The economy is bad. I am wise with my money and when my next check comes in i am gpiong to get a new window unit air conditioner. SO THERE ! I live in a nice house, but he did nail me on those taters...Love 'em. LOL!!! Thanks, donald. Your posts are almost as funny as the show. Misspellings, missed punctuation, not to mention your display of total ignorance that makes Andy look like a Mensa candidate. Bravo! Keep 'em coming. Only those that live in trailers and get welfare amd foodstamps watch the big 3 networks. Im about tired of paying foe your mashed taters and milk. WOOOOOOOOO This is a cruddy show. ITs on network tv so is aimed at the loosers of the world. Would you mean LOSERS? What exactly is a looser? Know the English language before you try to use it...especially if you're complaining. Otherwise, you look like an idiot.